As Associate Director, Undergraduate Admissions, in Enrolment Services, Paola Baca supports a team focused on high performance and student service. Through her leadership and commitment, Paola fosters a work culture to which everyone wants to contribute. Paola always focuses on creating an empathetic approach to student service. Day-in and day-out, Paola leads with a generosity of spirit and a willingness to lend a helping hand to others. She is dedicated to enhancing the student experience and strives to ensure positive experiences for students, as well as encouraging her staff to achieve their best results in providing student services at UBC. Paola’s contributions extend across the UBC community. In addition to her contributions to the Ride to Conquer Cancer’s Team UBC, she served as Chair of UBC’s United Way Campaign for the last two years, expanding the campaign to include a United Way Student Executive Team. Penelope (Lebby) Balakshin began working at UBC in 1974, and has served in a variety of roles, including Graduate Admissions Secretary, Head Secretary, and Administrator. In 2010, the successful move of 200 people into the new Beaty Biodiversity Centre, and the smooth opening of the Beaty Biodiversity Museum, were creditable to Lebby’s herculean efforts, organizational skills, and facilitative personality. In 2012, Lebby spearheaded a project to improve the courtyard at the Beaty Biodiversity Centre by working with campus partners to fix the courtyard drainage system to ensure the safety of the museum collections below, and bringing in native plants to showcase local biodiversity for museum visitors. During her career at UBC, Lebby has always gone the extra mile for students, colleagues, and the University as a whole. She is a facilitator among her colleagues, and a role model for the community. Ken Day has been with UBC since 1987 as the first (and only) Manager of the Alex Fraser Research Forest. In Williams Lake and surrounding communities, Ken is the face of UBC. During his years in the community, Ken has demonstrated excellence as a manager, field forester, academic associate, volunteer and leader. Ken and his staff extend invaluable assistance to faculty members, graduate students and others who conduct research on or in the vicinity of the Alex Fraser Research Forest. In addition to maintaining the financial viability of the Research Forest through good economic times and bad, Ken has demonstrated how BC’s interior forests can be managed to reduce wildfire and beetle hazards, as well as the integration of timber production, fuel management and grassland restoration. Under Ken’s guidance and leadership, the University Research Forests have become an irreplaceable educational tool in the forestry profession, and serve as a living lab for the University’s world-renowned research. Erin Shannon, Manager of Academic Support in Enrolment Services at the Okanagan campus, never hesitates to help others in supporting UBC’s strategic goals across the organization. Erin began her career at UBC in 2003 with Enrolment Services, and moved into her current role in 2010. Erin was a key player in supporting the 2012 Okanagan space utilization initiative. With her knowledge of teaching space and her interest in creating innovative learning spaces, Erin worked with her Kelowna and Vancouver colleagues to pull together creative ideas to transform teaching spaces for the benefit of the UBC community. Last year, Erin was co-lead on a project to implement new scheduling software across the University, and ended up moving into the lead role to provide direction for both campuses as well as creating and providing training materials. Erin has a keen understanding of UBC’s strategies and principles, and is able to contribute to strategy development at any level to move concepts into operations. Leah Walker is the Associate Director of Aboriginal People’s Health in the Faculty of Medicine. She provides quality leadership in connecting the academic mission of the Faculty of Medicine with the health needs of Aboriginal peoples. Leah is a true leader in guiding Aboriginal curriculum in the Faculty of Medicine and other health disciplines. Leah understands and fosters the relationship between the University and the community, a relationship that is rooted in mutual respect, accountability and reciprocity, requiring time and integrity in order to build trust. Leah is a true example for the UBC community on how we can continue to work with and learn from our Aboriginal communities. Leah’s hard work and dedication to the communities that UBC serves are crucial for the University’s success in following the path set by the Aboriginal Strategic Plan. 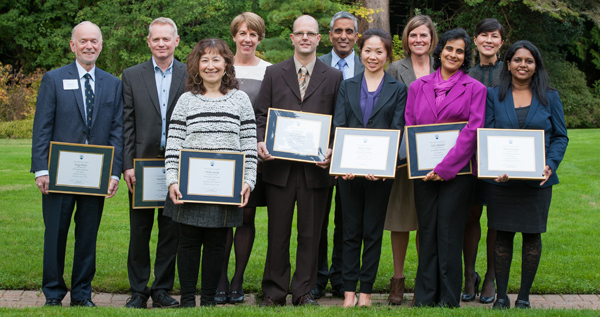 (l-r): Doug Polson, Lowell McPhail, Sandy Lapsky, Ann Campbell, Erick James, Arvind Gupta (UBC President), Diana Leung, Shannon Piedt, Farah Rabjabali, Samantha Turner, Devni De Silva. Not pictured: Carola Hibsch-Jetter, Aybaniz Ibrahimova, Andy Johnson, Stacey Simpson, Kate Turcotte. Devni De Silva, Assistant Director Finance & Operations at UBC Press, has successfully built strong relationships between the Press’s departments, placing paramount importance on communication and fairness. Devni’s skills, generosity, attentiveness, and support for her colleagues make an outstanding contribution to the overall culture of the Press, while her financial stewardship of the Press’s complex business activities has been invaluable to its success. True leadership comes from leading by example, and Devni does this easily. She is quick to identify the potential for career growth and advancement in everyone she manages. Her staff, past and present, speak highly of Devni and of their reluctance to leave the Press because they will miss working for her. Devni herself continues to acquire new skills and leadership capacity, and has recently enrolled in an MBA program. Samantha Turner, Research Communications Coordinator for the Wine Research Centre since 2009, displays a commitment to the faculty, staff and students not only at the Wine Research Centre, but to the broader University community. During her time at UBC, Samantha has been a positive influence at the Wine Research Centre by being a diplomatic liaison, often handling delicate situations within the Centre and with collaborators at other universities and organizations. Samantha is committed to spending the necessary time into putting the best light on grant proposals and other tasks to support the Centre’s operations. She is always willing to accommodate special guests and visitors to the Wine Library. In all that she does, Samantha is dedicated to improving the services of the Wine Research Centre and the University as a whole. Sandy Lapsky, Administrator, is a leader and community builder in the Department of Geography. Sandy is the “go-to” person in all matters concerning Geography. 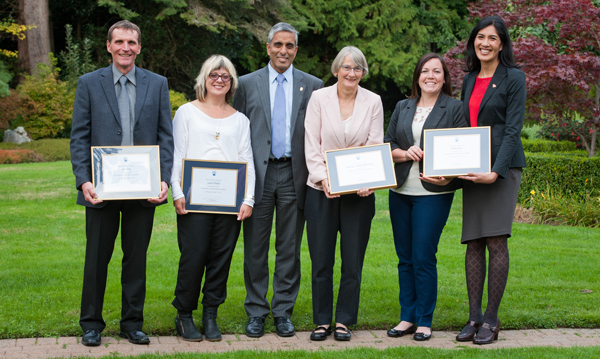 Her extraordinary commitment to supporting the community stood out during recent renovations in the Geography building, where Sandy was called on to manage concerns and ensure that everyone in the department had the support they required. In recent years, Sandy has spearheaded departmental outreach programs, in particular the Geography Cares initiative, to raise awareness for worthy organizations in the wider community. Sandy is skilled at drawing out the best performance in the staff around her, and is well-known for taking a personal interest in helping her staff succeed in their roles. Sandy is a charismatic leader, and is the binding that holds together the Geography community of faculty, staff, and students at UBC. Stacey Simpson, International Student Coordinator, joined the Faculty of Science in 2007 with dual responsibilities in academic advising and recruitment. As an academic advisor, Stacey connects science students to resources that enhance the quality of their lives. Stacey works with campus partners to find innovative ways to support students by working with the individual, seeing their particular needs that are informed within their specific cultural context. Stacey provides deep and multi-layered safety nets to catch signs that may not be visible on the surface and which relate to the students’ unique academic situations and other factors in their lives. From these experiences, Stacey improves the value of UBC’s student services, as UBC is better able to provide more robust support for our diverse student body, and to support individuals to achieve greatness as part of the UBC community. Erick James, Lab Manager in Botany, is an expert molecular biologist and technician as well as an artist, using metal to create sculptures based on biological themes. Erick played a leading role in the development of the Invisible Portraits exhibit at the Beaty Biodiversity Museum, featuring his microbial sculptures to demonstrate the beauty of microbial biodiversity. Erick’s creative approach to presenting his lab’s work beyond the scientific community has been a quantifiable hit. In a 2013 research article, he named two newly discovered microbial species after monsters from the fictional works of H.P. Lovecraft. This sparked the public interest as the publication went viral on social media, and was ultimately covered by traditional media outlets across North America. It is because of Erick’s creativity and artistry that a newfound appreciation for microbial biodiversity has emerged within the Beaty Biodiversity Research Centre, at UBC, and in the general public. Doug Polson is the senior machinist and technical supervisor of the machine shop housed in the Department of Earth, Ocean and Atmospheric Sciences. Doug is known for his innovation and creativity in design, his skill in high-precision machining, and his calm-under-pressure demeanor. His experience, skill and knowledge of machining are outstanding. He maintains a very high quality of service to faculty, students and other staff. In addition to his impressive craftsmanship, it is his cheerful and patient personality that promotes a productive collaboration and mentorship atmosphere with faculty and students. During his 41 years at UBC, Doug has helped design presses and equipment fundamental to the department’s research, working in partnership with students and researchers to literally build the world-class innovative equipment used in Earth, Ocean and Atmospheric Sciences, in support of the University’s research goals. In 2007, UBC Admissions brought in Ann Campbell (currently Director, Office of the Vice President Research & International) as a consultant to help with a review of communications. Today, the members of that management team are still sharing the skills they gained from Ann’s leadership with others on campus. Ann joined UBC as staff in early 2010 to lead communications effort for the newly formed UBC Sustainability Initiative. Thanks to Ann’s creative ideas and enthusiasm, groups from across campus have come together to tell a compelling story about sustainability at UBC. The most concrete demonstration of Ann’s leadership was the UBC Sustainability visual identity and Ripple Effect campaign, which launched in November, 2013. In her new role with the Vice President Research & International office, Ann focuses with enthusiasm on all aspects of the portfolio to maintain the emphasis on strategy as well as the day-to-day work. Dr. Lowell McPhail, Managing Director for the International Collaboration on Repair Discoveries (ICORD), has played a pivotal and essential role in ICORD’s growth and operation. Lowell’s contributions have helped ICORD become the world-class research centre it is today, including his crucial role in ensuring the design of the Blusson Spinal Cord Centre met the requirements of all users within the building during construction. Going above and beyond his duties as the managing director of ICORD, Lowell is genuinely interested in the lives of all the trainees housed at the Blusson Spinal Cord Centre, and can often be found providing career advice and encouragement to students in the many pursuits of graduate studies. In all his dealings with all ICORD staff, trainees and faculty members, Lowell demonstrates his commitment to the centre’s vision and mission to everyone who passes through ICORD’s doors. The first-ever group award in the Global Citizenship category goes to the BC Injury Research and Prevention Unit in Developmental Neurosciences & Child Health: Kate Turcotte, Fahra Rajabali, Shannon Piedt, Diana Leung and Aybaniz Ibrahimova. The team is dedicated to improving the lives of all British Columbians through their research and community efforts by effectively raising awareness and setting standards with campaigns such as the Community Against Preventable Injuries, and the online Concussion Toolkit. They excel at transferring knowledge and results into innovative and impactful tools for citizens, organizations, educators, coaches and parents, as part of their mandate of preventing injuries in all walks of life. The members of the BC Injury Research and Prevention Unit foster a unique collaborative environment of support and care that goes beyond a regular workplace. They are dedicated to supporting an amazing research and learning environment, which ultimately serves as a role model for the University community. Andy Johnson, Flow Cytometry Manager at the Biomedical Research Centre, joined UBC 13 years ago to manage the facility, which has grown from one instrument and a few isolated users, to support more than 70 research labs on campus in addition to other local research institutes and biotech companies. Andy ensures that the facility is more than a simple flow cytometry service; he trains users in the skills required to use the facility to their benefit, while providing any support and back-up they may need. Andy’s focus on training is one of his strongest points. His one-day training sessions have been attended by essentially every person using flow cytometry in Vancouver. For several years, he has hosted an internationally renowned one-week training course on advanced flow cytometry techniques attended by students from around the world. Andy’s outstanding work supports UBC’s reputation as a research leader in the local and international scientific communities. Carola Hibsch-Jetter, Manager of Strategic Initiatives in the Faculty of Science Dean’s Office, plays a key role in advancing equity and inclusion at UBC. Carola’s work has been vital to the continued success of the Faculty of Science in tracking data for equity and diversity issues on faculty matters. Over the last two years, Carola has also been seconded part time to work with the Senior Advisor on Women Faculty. Carola’s practical perspective in working with Faculties and departments is integral to developing programs and practices that are effective across all levels of the University. She has made wide ranging contributions to diversity and inclusion in the areas of working environment, career advancement, and professional development, complemented by her support for implementation of best practices, policies, and principles. Carola’s efforts continue to benefit UBC as a place dedicated to advancing diversity and inclusion.